Around 4000 B.C. 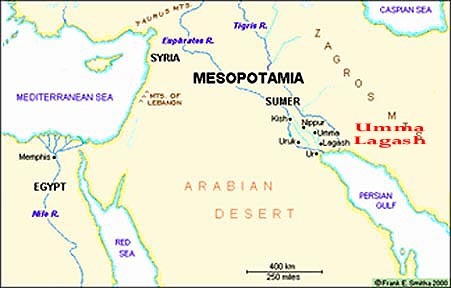 city-states began to develope in ancient Mesopotamia. With their growth, conflicts developed among them. Warfare often arose as the result of wealth, control of the Tigris and Euphrates for transportation and irrigation, boundary disputes, and the need to acquire luxury goods such as timber, stone and metals. The almost constant occurrence of war among the city-states of Sumer for two thousand years spurred the development of military technology and technique far beyond that found elsewhere at the time. Although it is not the earliest conflict, the first war for which there is any detailed evidence occurred between Lagash and Umma in 2525 B.C., two Sumerian cities located eighteen miles apart. 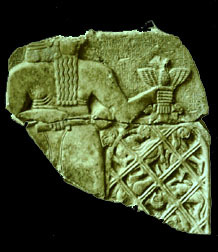 For generations, Lagash and Umma contested the possession and agricultural usufruct of the fertile region of Guendena. As the result of the violation of an earlier boundary treaty by Umma, Lagash went to war with Umma. In this war Eannatum of Lagash defeated the king of Umma. The importance of this war to the military historian lies in a commemorative stele that Eannatum erected to celebrate his victory. 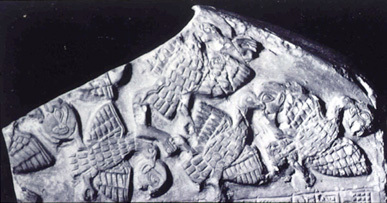 The stele was excavated in fragments and is known as The Stele of Vultures because one of the fragments depicts vultures carrying off the heads of the defeated troops. The stele represents the first important pictorial of war in the Sumerian period. The lower left portion of the above stele fragment is shown below. 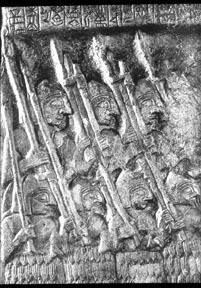 It depicts spear bearers. They, as well as the soldiers in the phalanx, wear helmets. This is the first historical evidence of soldiers wearing helmets. 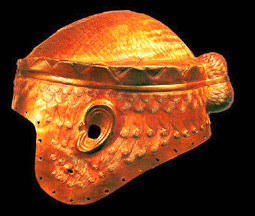 The helmets were probably made of copper and had a leather lining or cap underneath. Similar helmets were excavated at the Royal Tombs of Ur. Such helmets rendered the once formidable battle mace ineffective. From the tomb of Meskalam-dug is this heavy gold helmet exquisitely engraved to reproduce the curls of his hair and the bun at the back of his head. Royal Cemetery of Ur, about 2500 B.C. Iraq Museum, Baghdad. 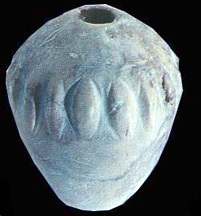 Pear shaped mace head made of limestone circa 3000 B.C.. Found in Mesopotamia. The first military application of the wheel is depicted on the stele which shows Eannatum riding in a chariot. The Sumerian invention of the chariot ranks among the major military innovations in history. 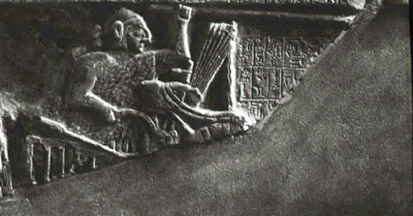 The earlier Standard of Ur also depicts the Sumerian development of the chariot. 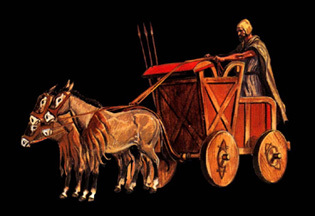 These chariots were primarily four wheeled vehicle drawn by onagers (wild asses). There were very cumbersome and were probably used for battlefield transportation rather than attack vehicles. 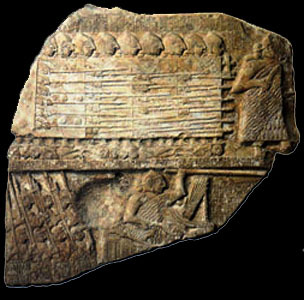 The lower palette of the Stele of Vultures shows the king holding a sickle- sword which became the primary infantry weapon of the Egyptian and Biblical armies at a much later date. 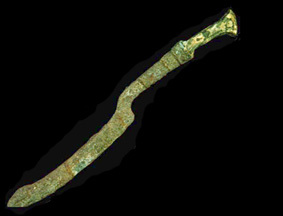 It is believed that the Sumerians invented this important weapon sometime around 2500 B.C. 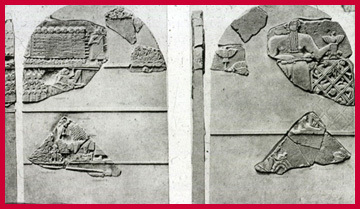 Both the Vulture Stele and the Royal Standard of Ur show soldiers wearing what appear to be armored cloaks. They were probably made of thin leather with metal disks with raised centers or spines sown on the cloaks. 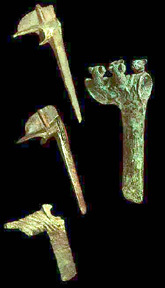 These cloaks afforded some protection against the weapons of the day such as the copper socket axe. 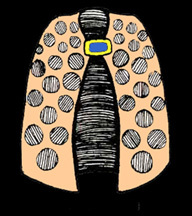 Sumerian body armor drawing, 2500 B.C. When the Sumerians introduced the use of overlapping plate body armor, it was quickly followed by the development of the bronze socket axe. Sumerian axes by 2500 B.C. show a change in design with the narrowing of the blade and bringing it more to a point so that it could pierce bronze plate armor. This became one of the most devastating weapons of the ancient world. Below is a small plaque of engraved shell from the ancient city of Mari on the Euphrates showing a warrior of about 2500 BC with metal helmet, battle-axe and sickle-sword. Musée National de Louver, Paris. An interesting fragment from the Stele of Vultures shows Nin-girsu, the god of Lagash, grasping a net in which his diminutive enemies have been caught. Here, the glory is given to the god. The information shown herein predates the rise of Sargon the Great of Akkad who conquered all the Sumerian states, the entire Tigris-Euphrates basin, and brought into being an empire that stretched from the Taurus Mountains to the Persian Gulf. Sargon united both halves of Mesopotamia for the first time since 4000 B.C. A Short History of War, Chpt. 2, The World's First Armies, Air War College, Maxwell Airforce Base. How War Was Waged, E. M. R. Freeman, University of Manchester, Faculty of Arts. Essay, How War Was Waged in Southern Mesopotamia, Patrick Holmes.